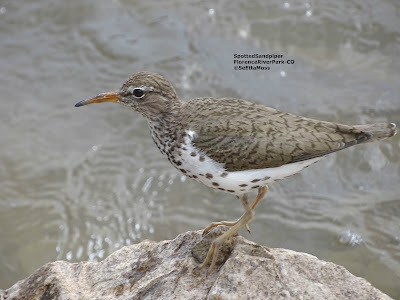 I had to sneak up and sit, partially hidden from the parent, about 35 feet from where I watched the Spotted Sandpiper chicks in order for the parent bird to let these chicks come out from inside the vegetation where I could watch and photograph them. The parent continued in a state of alert and called the chicks back into hiding several times when other park users walked by. 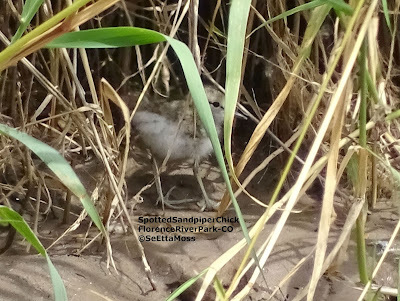 I was able to see two chicks together at one point but not sure if there may have been more as otherwise I only saw one at a time, and then usually at least partially obstructed by some vegetation.